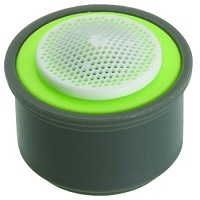 Neopearl design a small PCA Spray Aerator insert that provides a constant non-aerated "shower like" stream. This product is a 0.5 gpm. It allows the anti-clogging white dome screen filters for sediment and particles.